Investigation of several thousand captures reported by BASS members over the years indicates that not all days are equal for bass angling. Unfortunately, we cannot determine success by the day of the week – the important factor is the time in the lunar cycle, which in turn determines the cycle of the tides. Always remember, however, that these figures are averaged across the country. 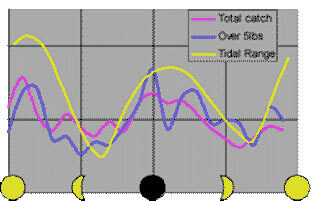 Individual marks may fish best on particular states of the tide – some marks even fish best on the smallest, neap tides. In the absence of any better local information, it would seem that you are more likely to catch fish around spring tides. Although we do not have the same sort of data for time of day, few bass anglers would dispute the periods around dawn and dusk as being the most successful for shore angling. From a boat, the state of the tide seems more important than the time of day. Again, we can use the BASS members records to define the main season for bass. 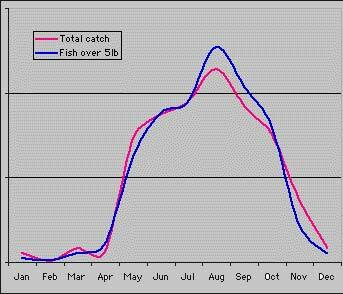 It is evident that most fish are caught between the end of April and the end of October. In the south west of England and the south west of Ireland, the season is longest; the further north, the shorter the season. While August appears to be the most productive month, this may just reflect the month when angler’s put the most effort in. Bigger fish often turn up in catches in September and October. Interested, then read this article by Joe Bucher, a well known guide in the USA.